The Pacific War Online Encyclopedia: Hunt, LeRoy P.
Hunt was selected to participate in the Grand Conference that reviewed the Tentative Manual for Landing Operations in December 1933. He later led 5 Marine Regiment at Guadalcanal. However, he was one of the officers sent back to the mainland by Vandegrift when a call came for cadre for new formations in September 1942. Though Hunt was an old friend of Vandergrift, it was widely believed by other Marine officers that Vandegrift selected those officers for cadre he felt had not measured up. 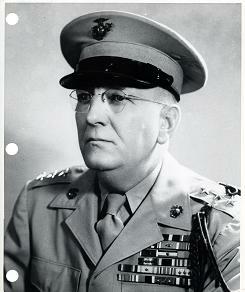 Hunt commanded 2 Marine Division from June 1945 and led the division in its occupation duties in Japan following the surrender.